Our Design Team is growing and we love it! Today we want you to meet our latest addition – talented Marta, a paper crafter certain to brighten the Pion blog with amazing projects! Hello, my name is Marta Turska – Grochocka, also known as JaMajka. 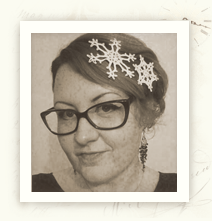 I’m a scrapper, art journal creator and mixed media creator, and I love making cards and Artist Trading Cards. I’m a mother of 8 year old girl Maja, I’m a wife, I write songs and I sign too. I’m inspired by nature, by music, books, thoughts, people and by life itself. I’m messy and colorful just like my art. I think it’s a great honor and a huge pleasure to be a part of this amazing Design Team!